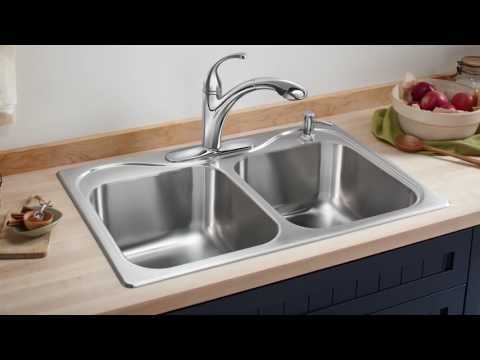 Top-Mount Single-Bowl Kitchen Sink, 25" x 22" x 7"
Add sleek, modern style to your kitchen with the rounded corners and minimalist design of the Middleton kitchen sink. Stainless steel construction ensures years of quality use, and SilentShield(R) technology, an exclusive sound-absorbing system, reduces noise and vibration. Add sleek, modern style to your kitchen with the rounded corners and minimalist design of the Middleton kitchen sink. Stainless steel construction ensures years of quality use, and SilentShield© technology, an exclusive sound-absorbing system, reduces noise and vibration. Dimensions: L 25", H 7", W 22", D 7"